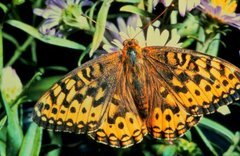 ...the rare Oregon silverspot butterfly brought together federal, state and regional agencies and conservation organizations in a decadeslong campaign to preserve Big Creek. The groups waited and pressed and waited some more until this year, when The Nature Conservancy bought the 193-acre parcel for $4.07 million. ...Pickering, the coast ecologist for The Nature Conservancy, stood in the Big Creek meadow on a frigid, cobalt-blue morning earlier this week. The summer's Oregon silverspots were long dead; their progeny were caterpillars, tucked in the meadow duff to overwinter. They will emerge from late July to September, and lay their eggs during a brief, three-week life span. ..."It is the most prudent thing to do, to try to save all the pieces. We don't fully understand how all these pieces fit together. Who knows what else the butterfly's role is? "We're often not as wise as we think we are. Nature is complex, and it's healthier the more complex it is." ...The Big Creek property is special for many reasons. It connects to the Rock Creek Wilderness of the Siuslaw National Forest and the Carl G. Washburne Memorial State Park. The property straddles Big Creek and changes from coastal meadows to dense, old growth spruce forest as it climbs from the sea. The plot was coveted for decades for radically different uses. ...In 1980, the Oregon silverspot was listed as a threatened species under the federal Endangered Species Act. The butterfly once ranged from southwest Washington to Northern California, but now only four populations survive -- one in Northern California and three on the Oregon coast, including Big Creek. It wasn't just the butterfly. The Big Creek property was habitat for threatened Northern spotted owls, marbled murrelet and pacific salmon. "You can have $20 million and not find an equivalent property," said Paul Engelmeyer, who manages the Audubon Society of Portland's Ten Mile Creek Sanctuary and discovered the secretive inland nesting habits of the marbled murrelet. "Property with four endangered species, abutting public land with no nearby development. "Big Creek is pretty much perfect." ...The many agencies and organizations involved with the property will set up a management plan. Eventually, the land likely will be turned over to the Oregon Parks and Recreation Department. ...The butterfly needs coastal meadows. It lays its eggs on the early blue violet. The tiny caterpillars eat only violet leaves. Plants that need open ground -- asters, goldenrod -- provide nectar for the adult butterflies. Historically, native tribes periodically burned the meadows to encourage grasses and food plants. That was good for the butterfly. But the meadows became prime real estate for vacation homes and hotels. Those that survived the bulldozer were covered by the march of salal and spruce that was no longer checked by fire. What were meadows 40 years ago are now mature forest. ..."When we help the Oregon silverspot, we see other species benefited. It reaches across more than just that one species. It's preserving a rare habitat. We have few grasslands on the coast anymore."